The works of painter Truong Ngoc Chinh (aka: "David" Chinh) present scenes of idyllic innocence and vehement faith. A deeply held devotion permeates his work, as do exclamations of hope through vivid examples, some of which seem to be inspired by mythic legends. At their heart, these works bear a love of humanity and as the artist states: "possibilities for receiving grace". In these works, the turmoil of the world rubs elbows with aspects of the artist’s faith and hope but, through it all, Chinh seems to find an intense dignity that shines richly in these textured works. Chinh's works seem to convey a narrative for a better world to come, whether their subject matter is catastrophic, celebratory or simply common. Truong Ngoc Chinh was born in Vietnam, and now lives and paints in California. He cites Van Gogh, Leonardo Da Vinci, Monet and Picasso as influences. In 2003, Chinh was invited to exhibit his work in Montreuil-Sur-Mer, France by the Mayor of Montreuil-Sur-Mer, and this is when he had the opportunity to study in the Louvre Museum, Paris France. Much of his skill is attributable to his dedication and study of the works of the old masters. "I have read many biographies of master painters", said Chinh "I enjoy doing extensive research into the styles and techniques of master painters. Over time I have amassed a variety of painting techniques and skills. Using Oil, water-colour or acrylic I have learned to be able to put on canvas what I see in my mind". Currently exhibiting his works in the prestigious Hyder Gallery center for fine art - Orlando Florida USA Gallery, his work has been highly praised by its curator Andrew D. Hyder. "Chinh's work really seems to connect with my collectors", said Curator Andrew D. Hyder. "I look forward to each new work of art that he [Chinh] produces. His work really adds something special to our gallery." Chinh's paintings have appeared in the Asian Pacific Museum in Poland, the Living History Museum in France, and in many international embassies and Fine Art galleries around the world. Chinh has been selected as one of the 60 best masters in the world by Arttour International Magazine. Chinh's work will be on display at the ATIM Masters awards in May 21st 2016 Ceremony exhibition in Chateau Saint-Martin-de-la Garrigue Montagnac, France. For more information on Truong Ngoc Chinh, visit http://www.missiongalleries.com/ (714-514-6196) or when in Orlando Florida, visit the Hyder Gallery Center for Fine Art located in the Artegon Marketplace Mall - International Drive (612-382-5566). 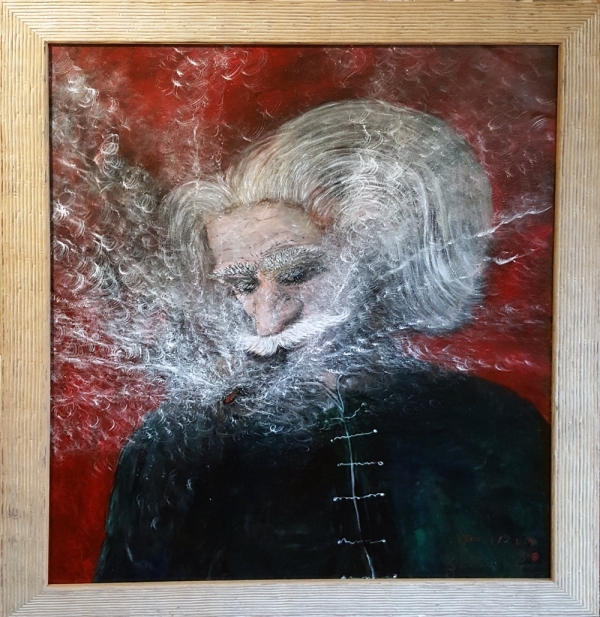 Height 40" x Width 31" x Depth 1"
The Artists interpretation of Albert Einstein Exhaling wisdom upon the world and giving the light of clarity in physics. David Truong Ngoc Chinh Professional Artist The works of painter Truong Ngoc Chinh (aka: "David" Chinh) present scenes of idyllic innocence and vehement faith. A deeply held devotion permeates his work, as do exclamations of hope through vivid examples, some of which seem to be inspired by mythic legends. At their heart, these works bear a love of humanity and as the artist states: "possibilities for receiving grace". In these works, the turmoil of the world rubs elbows with aspects of the artist’s faith and hope but, through it all, Chinh seems to find an intense dignity that shines richly in these textured works. Chinh's works seem to convey a narrative for a better world to come, whether their subject matter is catastrophic, celebratory or simply common. Truong Ngoc Chinh was born in Vietnam, and now lives and paints in California. He cites Van Gogh, Leonardo Da Vinci, Monet and Picasso as influences. In 2003, Chinh was invited to exhibit his work in Montreuil-Sur-Mer, France by the Mayor of Montreuil-Sur-Mer, and this is when he had the opportunity to study in the Louvre Museum, Paris France. Much of his skill is attributable to his dedication and study of the works of the old masters. "I have read many biographies of master painters", said Chinh "I enjoy doing extensive research into the styles and techniques of master painters. Over time I have amassed a variety of painting techniques and skills. Using Oil, water-colour or acrylic I have learned to be able to put on canvas what I see in my mind". Currently exhibiting his works in the prestigious Hyder Gallery center for fine art - Orlando Florida USA Gallery, his work has been highly praised by its curator Andrew D. Hyder. "Chinh's work really seems to connect with my collectors", said Curator Andrew D. Hyder. "I look forward to each new work of art that he [Chinh] produces. His work really adds something special to our gallery." Chinh's paintings have appeared in the Asian Pacific Museum in Poland, the Living History Museum in France, and in many international embassies and Fine Art galleries around the world. Chinh has been selected as one of the 60 best masters in the world by Arttour International Magazine. Chinh's work will be on display at the ATIM Masters awards in May 21st 2016 Ceremony exhibition in Chateau Saint-Martin-de-la Garrigue Montagnac, France. For more information on Truong Ngoc Chinh, visit http://www.missiongalleries.com/ (714-514-6196) or when in Orlando Florida, visit the Hyder Gallery Center for Fine Art located in the Artegon Marketplace Mall - International Drive (612-382-5566).